Tennis is considered to be one of the best outdoor games for fitness. The Sports Gurukul offers International tennis coaching program in Mumbai. We have highly experience certified coaches. We provide tennis coaching for kids and adults. Separate batches for different skill levels from basic, intermediate and advance. Our facilities are equipped with good quality equipment’s to help our students to learn the best tennis. The Sports Gurukul in association with Australasian Academy of Tennis Coaches (AATC) at our various locations to provide best tennis coaching in Mumbai. The AATC was formed to provide an option for students / players who want to attain highest standards in coach education. AATC presenters have over 25+ years of coaching experience and 35+ years of playing experience. AATC has been providing coach education and professional tennis knowledge to all levels for many a year. STAR Tennis Academy, a joint association between The Sports Gurukul (TSG) and the Australasian Academy of Tennis Coaches (AATC) was launched in 2014. AATC TENNIS MINI TENNIS – LEARN • FUN •DEVELOPE – An ideal program for children in the 4 to 7 age group. AATC TENNIS ACTIVE – TRAIN • BOOST • ENERGIZE – A program for people looking for playing a sport to live a healthy and active life. AATC TENNIS AEROBICS – PLAY • BURN • SWEAT – A program with heart-pumping workout. Play tennis & burn 100’s of calories in a single session. 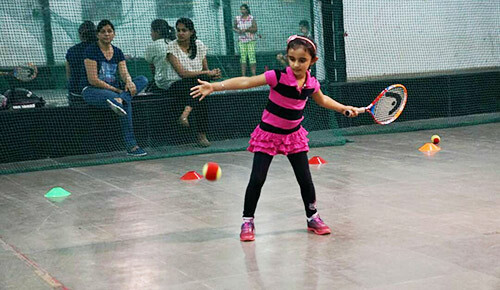 AATC TENNIS AEROBICS – A program catered to 10 – 18 years for helping them achieve Inter-school & College excellence. This would be the step which would then propel a layer in to professional league. AATC TENNIS PRO – PROFESSIONAL • POWERFUL • INTENSE – A program exclusively designed for players aspiring to become professional champions. Structured lesson plans to ensure consistent and thorough coaching. Each session designed with a goal in mind (such as working on agility, power or speed for advanced students, a particular stroke or strokes for beginner groups). Ongoing video analysis for each participant. Individual participant assessment & bench-marking at different levels. Coach to participant ratio of 1:8 to ensure individual attention to each participant. State of the art coaching techniques / equipment’s to ensure participant development.